"Ukraine is high in the American news, and it is in this problem that is key to lifting sanctions from Russia." US Ambassador to Russia Jon Huntsman believes that an improvement in US-Russian relations is impossible without the settlement of the situation in Ukraine. "The situation in Ukraine presents certain difficulties, especially because we do not see significant progress here, but Ukraine is perhaps the only such important topic that could breathe new life into the bilateral relations between Moscow and Washington," Huntsman said as quoted by Channel 24. The ambassador said Ukrainian topic is high on the US media agenda and this problem is key to the lifting, at least partial, of sanctions from Russia." 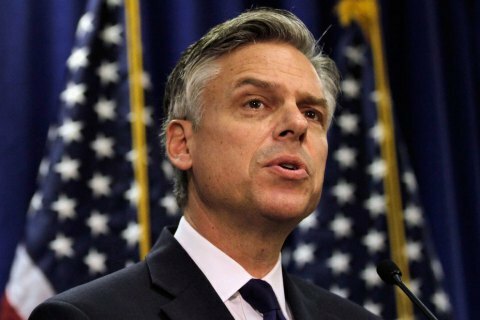 "Ukraine is crucial for the restoration of our relationship with Russia," said Huntsman. Commenting on the statements of the US special representative for Ukraine Kurt Walker that with a 80% probability that the intensity of fighting in Ukraine will continue next year, Huntsman said: "I hope that no, it would be bad for the short-term fix our relationship." At the same time, the ambassador described Volker as an experienced diplomat who knows the region well. "Volker has coordinated and continues to coordinate his efforts with the Secretary of State, Minister of Defence and National Security Advisor. President Donald Trump is closely monitoring his work. I know it because he attended many meetings where Volker spoke. Many people closely watch his work. If a progress is made, it will demonstrate that we are moving in the right direction," Huntsman said. The US ambassador also noted that the position of the Volker is more than just the position of the Department of State, because he represents several ministries. "Before being announced at the talks with the Russian president's aide Vladislav Surkov, this position is carefully coordinated within the US government," said Huntsman. Earlier, Volker said that Russia retains 100% control over what is happening in Donbas.